Well it’s been quite a busy last few months for the CityEngine team and honestly, it’s just so exciting to see in which direction this is all heading! It feels like we only just introduced CityEngine 2018.0 to you, but just like that its suddenly September and we’ve proudly released another new version of CityEngine to the world! CityEngine 2018.1 introduces a whole bunch of new features and exciting improvements that not only set a great precedent for things to come, but are sure to make you love CityEngine even more. Have a look at some of our favorite release highlights below. You can learn more about all of our new features and fixes in the 2018.1 release notes. Go to My Esri to upgrade to CityEngine 2018.1. Or, if you are new to CityEngine, try it out now with a fully functional free trial version. In this release, we introduce new easy-to-use tools for drawing shapes of any form. For example, you can now draw building footprints with arcs, circles, and round corners. Also, these curved 2D shapes are useful when designing parks and recreational areas with winding paths, vegetation areas, and ponds. Additionally, to further improve the drawing experience of these complex shapes, CityEngine offers new tools to offset edges and union 2D polygons. Typically, urban layouts are organized by alignment and parallelism. Therefore, we added new ad hoc snapping guides. You can now set guides at arbitrary angles based on existing geometry to efficiently and accurately create building footprints aligned to blocks, streets, or other footprints. Finally, you can import hand-drawn sketches into your scene and use them as textures on your terrain. Evaluate different designs in a geolocated 3D environment, and use them as blueprints to trace sketched parcels, footprints, or streets. CityEngine now allows you to export a terrain layer as an elevation tile package (TPK, with LERC compression), that you can merge with Esri World Elevation Services in Scene Viewer. For example, local ground modifications caused by new urban development or more detailed street geometry, can be published in web scenes on the ArcGIS platform. You can now define the working extent of feature layers on the web. This is useful if you have a large layer with hundreds of thousands of polygon features, such as building parcels or footprints, that are too big to load into CityEngine all at once. Therefore, we added a graphical UI where you can work with only a subset of the large feature layer. 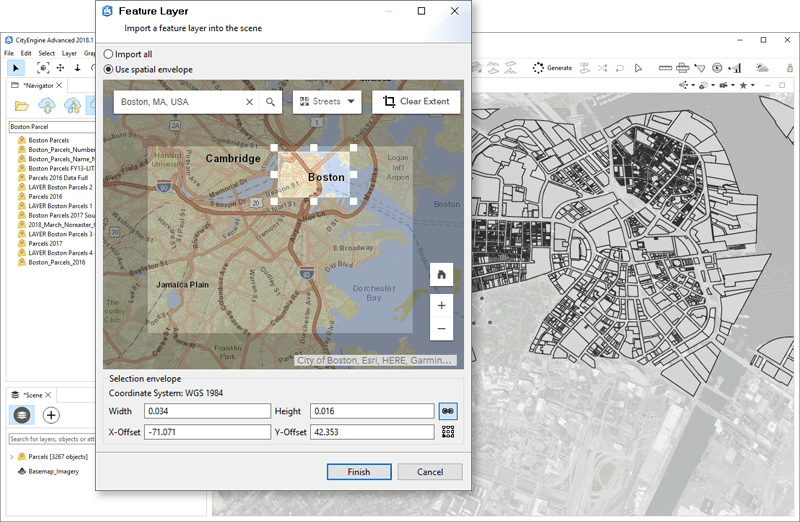 You can set the extent on a 2D map to import or sync a portion of the large layer. For example, it is possible to select only a neighborhood of interest in a city to import into CityEngine for further urban design and editing workflows. CityEngine maintains a live data connection to the web layer. 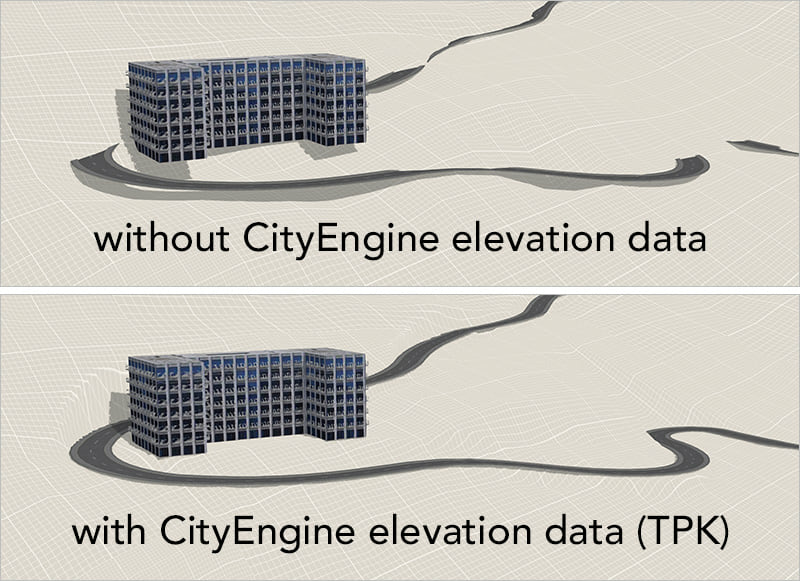 Therefore, edits in CityEngine can be synchronized with the larger feature layer, allowing for cloud-based or collaborative editing workflows. 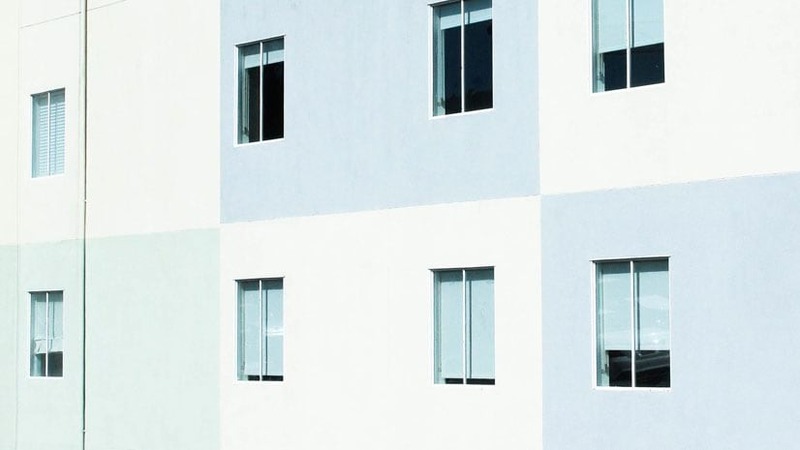 In the Esri rule library, new rules for creating fences, walls, and dividers have been added. The procedural rules are available out of the box and can be applied on parcel polygons to create perimeter fences or street graph segments to create fences along curved and hilly freeform lines. Follow Esri CityEngine & Geodesign on Facebook, Twitter, and Instagram.